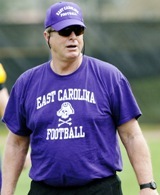 When Mike Leach was hired at Washington State and took three East Carolina coaches with him, ECU skipper Ruffin McNeill made not only a purposeful hire in bringing former Pirate and long-toothed coach Kirk Doll back to Greenville, but also may very well have brought in a missing ingredient to the program. Specifically, ECU's new Special Teams Coordinator brings an old school approach to special teams, one in which it is not only a privilege to earn a spot on a special teams unit, but also where special teams are transformed from a transitional phase of the game to a vital role. It's a concept designed around the principle that each time a unit goes out on the field, a critical aspect of the offense or defense accompanies the unit. Kirk Doll answered the call from his alma mater this spring and returned as a key coach. Doll indicated that, like the offensive and defensive starting spots, the best players are vying for key slots on special teams units and that injection of talent and competition is also spurring on the younger guys, who see it as chance to prove their worth in their respective positions on the O or D.
As offensive coordinator Lincoln Riley stated recently in regards to the running backs, Doll’s approach to fostering competitiveness has revved up each of the backs on this team, taking them to new levels of play. Similarly, on special teams, Doll coach has engendered a competitive culture for the coveted slots on the various special teams, which is expected to lead to positive change in that aspect of the game. 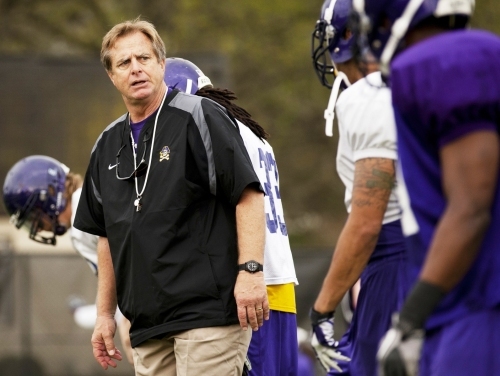 With that comes some adjustments to the basic scheme employed at ECU which was put in place in the spring. Doll said that the game-planning will evolve as the key specialists lock in on the depth chart. But for now, the veteran coach is just thankful that his boss, Coach Ruff, gave him ample time in the spring – more than he has ever had – to put the foundation in place. Though many questions will be answered in the fall, Doll was kind enough to talk through the Pirates' progress in the crucial special teams aspect of the program. And, in doing so, he indicated the lead candidates for at least some of the positions coming out of the spring. Bonesville (BV): Looking at last season, special teams were not what we would say was a highlight. Can you talk a little about your thoughts going into camp – based on what you saw on film and gathered from meeting the coaches and players – and what you saw in camp? How are you feeling having completed camp? Kirk Doll (KD): Basically, I know things were not where they were supposed. Honestly, I like going in and (evaluating) everything myself. I had the chance to evaluate the kickers and the players in the spring. There is a lot of interest and effort by the coaches, because they know it is going to help us, all of us, perform better and be more productive – offensively and defensively. Their interest carries over to the players, so what we are doing right now is evaluating the best players available for each of the teams, but not push it to a saturation point where a guy is a starter and playing on every special team. That is not going to happen. But, we are going to have the best guys – whoever they are – are going to be out there. The specialists play such a vital role so as we look at these guys, it is really exciting. You look at the development of a guy like Warren Harvey – he had a great spring and we are really happy to have him here. You look at Charlie Coggins, the long snapper. He is a young man with a lot of talent and we have other specialists here that are good, like Trent Tignor who does a good job on the hold and is also competing with Phil McNaughton for the punting job. There is not a clear cut leader there right now, but they each have qualities that we like, and if we have to situate our schemes accordingly for them to be the most productive, we’ll do that. BV: Let me dig a little deeper into the coverage teams. Last year the field goal unit wasn’t bad and the punting was not horrible. What are you looking for in coverage skills at ECU now that you are here? KD: Special teams, kickoff coverage… you normally use defensive players because they have to be able to tackle. But sometimes like when I was at LSU, two of our best kickoff guys were offensive players. Michael Clayton was a wide receiver and Jacob Hester was a running back who came on later (in his career). A lot of times you can have the best scheme in the world and if you have a coverage set to cover to the left and your guy kicks the ball to the right, well, he has stressed your coverage unit. Now, that is no excuse for the other team to go and score every time that happens, but at the same time you are trying to integrate the scheme and the execution. So, what I am saying here is that the specialists themselves are what make a special teams unit special. BV: You were with these kids for the spring camp. Did you feel you needed to come out of camp with a depth chart set for the specialist positions? KD: Yes… yes. We have a starting point and we talk about things a lot in terms of who is going where and being used how and why. Coach Ruffin McNeill was just awesome. He gave me much more time (to work with the specialists) than anywhere I have ever been to work for spring practice. He was very accommodating. Not that things were bad (last year) but we did see things in our scheme and so we were able to get our base plan in and will work on game planning as we get closer to the game with Appalachian State. BV: Given that time with the players, are you seeing that we have the players to make these schemes fly or are you seeing things that lead you to believe that we may not have certain players to be highly effective in a given special teams unit? KD: Our philosophy is that we are a vehicle for the offense and defense and as such we don’t want to be a junk car — we want to be a race car. We want to set the table, so to speak, in terms of field position for the offense and the defense as well. So, this thought process has to be continually talked about with our players. We talk about, say, the ratios of when we kick off and our opponents start on the 20 compared to the 35 and how much the chances of the opponent scoring go up – which is significant. Conversely, it is easier to call a play when you are 1st-and-10 on your 35 than it is on your 15. So, that is what I am working on in the spring. These young men are not only trying to learn their offensive or defensive responsibilities but learn the special teams. So I am really happy with the opportunity that Coach gave me to work with these guys and I think they see how important it is to know what we are doing and compete accordingly for those jobs. BV: You isolated a few positions – place kicker with Warren Harvey, deep snapper with Charlie Coggins and holder with Trent Tignor and also noted that the punting job is still very much undetermined. Do you feel like the three young men you named are top of the depth chart coming out of spring in those positions? KD: Well, yeah, right now that is what I see going into fall. You never know what is going to happen though. We have some young guys coming in at different positions and if they can be more productive, then they are going to get their chance, too. BV: In terms of Warren Harvey is also vying for kick-off duties? KD: Yes, yes he is. You know, he has really hit the weight room with Coach (Jeff) Connors which has helped him in terms of leg strength. Plus, they have the new rule of kickoffs at the 35 yard line so a lot of guys are not stressing their leg strength now. We have a couple guys that could potentially win that kickoff job. Right now, though, Warren is that guy who is doing well. BV: Turning to punting, looking at the stats in the spring – not understanding all of the kicking situations that Trent and Phil were put in during practices – do you feel like between these two guys, we have the tools to punt well in 2012? From an average perspective and also from a situational perspective... inside the 20, etc.? KD: Yes, I do. They were put in a couple situations where we were kicking the ball – some would call it pooch kicking – trying to get it inside the 15, 10 yard line, and I want to say at least two, maybe three of those four punts (spring game) were that way. A lot of time statistics are misleading in punting. The biggest thing those two are working on, obviously, is consistency. You know, Phil has great leg strength and he has been trying to learn this (position) for a couple of years now and I think he has made really good strides with it. Trent has been working hard as well. Now, Trent is a long-lever guy, which is the kind of guys you want. Again, it is consistency, but we have two very hard workers so I expect there will be some back and forth this summer. BV: Looking back over your career at situations like this with a couple (of) high potential guys, do you feel confident that one of them will develop that kind of consistency by the time the Appalachian State game rolls around? KD: Well, I wish I could predict it. I would like to think so because of their work ethic. You never know what is going to happen when it comes to young people. For example, the field goal kicker I had at San Jose State last year ended up being the second-leading field kicker in the country and the year before that he was on the field maybe only three of four snaps. He was a Swedish guy who was older, but it took a little longer for the light switch to come on. Those things you just never know. Another time I had a kicker that I thought was great and he ended up having a mediocre season. I have seen both ends of it. It is a different type position and psyche. The best thing is we have a group of great young men and great students who are dedicated and work hard to do a great job for the team. BV: What are the return specialists looking like right now? KD: Return wise we have some good youngsters back there. I am kind of excited about seeing them some more in the two-a-day practices (in the fall) and we have some other guys coming in that have some talent as well. The great thing about it is that there is a lot of competition and the more competition you have the higher level each of those young men will reach. That is kind of where we are right now.